It is not an easy task to summarise the content of a lecture in the title in such a way as to both inform the reader/audience as well as to arouse their curiosity. As you will see in the course of this talk, my attempts at an effective wording for this title have resulted, at best, in an elegant generalisation. Firstly, because this is not really a matter of a mere restoration and secondly, in this particular case, the description “Spanish Factory-Made Guitar” is surely far too generalised. Then again, this wording reflects my discoveries while working on this instrument: that which I initially regarded as a matter of straightforward craftsmanship increasingly revealed itself to be a small but, in terms of the history of Spanish Guitar Making, significant saga reminiscent of a Sherlock-Holmes mystery. The Viennese This presentation focuses on the history of this guitar and its player, the Viennese guitarist Luise Walker (1910-1998), as well as that of her teacher, Miguel LLobet. 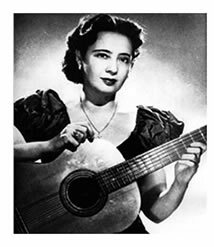 The era in which Luise Walker pursued her career was of great significance in the history of the Guitar. It was the dawn of the so-called “Golden Age” of the Classical Guitar with figures such as Tárrega, LLobet and Segovia gracing concert stages and attracting a growing international audience. Along with these great artists were the great guitar makers such as Santos Hernández from Madrid, who built numerous beautiful and important instruments of his time. 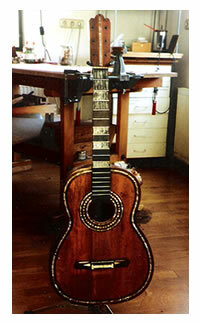 The guitar Luise Walker played is held by experts as the most beautiful surviving “Santos”. After Ms. Walker’s death I had the privilege of thoroughly researching and measuring this instrument within the context of repair work.